The Alabaster Sphinx is beautifully erected near the remains of Memphis. The carving was made in honor of a Pharaoh who was actually unknown. 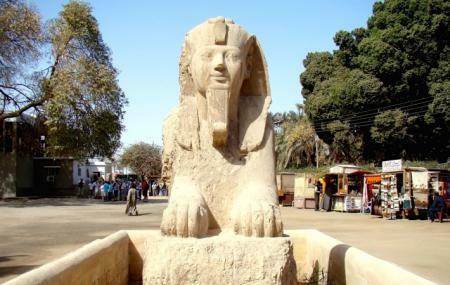 The sphinx is 8meters (26 feet) long and 4meters (13 feet) tall and weighs about 90 tons. Its appearance has deteriorated over the years. The sphinx has a human head with a lion’s body sitting in a crouching position. The Alabaster Sphinx is also referred to as the calcite Sphinx. How popular is Alabaster Sphinx? People normally club together Osiris Hall and Memphis Museum while planning their visit to Alabaster Sphinx.